Christ Church Cosway Street, by Thomas Hardwick . The redundant church of Christ Church Cosway Street is in Marylebone, south and west of Regent’s Park. Cosway Street may be found by following Marylebone Road westwards, and lies on the north side just after Lisson Grove. Closed in 1973 and now business premises, Christ Church can only be seen from the outside. It is included on these pages as an example of the later work of the architect Thomas Hardwick, who as in some of his other works, was assisted by his son, Philip Hardwick. 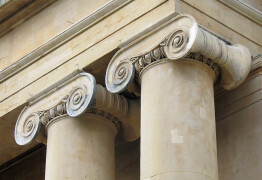 Ionic capitals to portico pillars . The church is complete and undamaged on the outside. 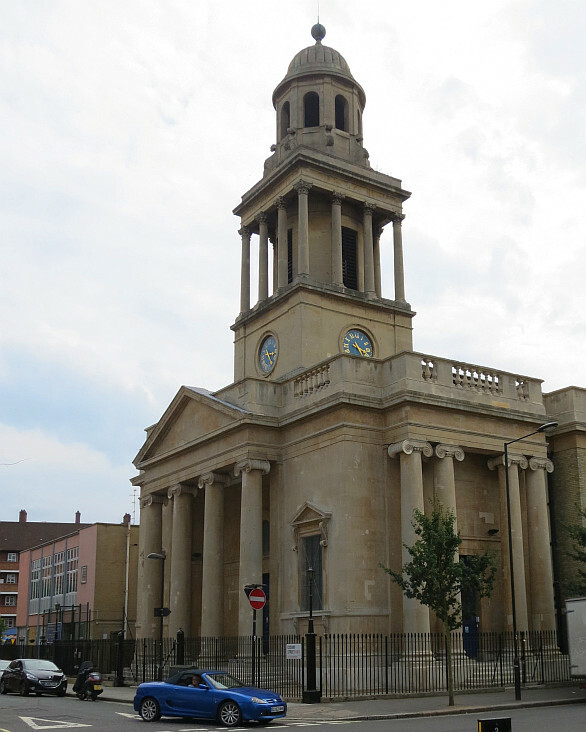 We see a substantial pale stone-clad Classsical edifice (the nave inside is of brick), essentially a broad box, which with the date gives it away as a Commissioner’s Church, that is to say, one of the 600-odd churches put up between the 1820s and 1850s by the Church Building Commission, using 1.5 million of Government money to address concerns that Anglican churches poorly served the expanding populations of the suburbs, and often built as boxlike affairs with the emphasis on speed of building and keeping the cost down rather than individuality. 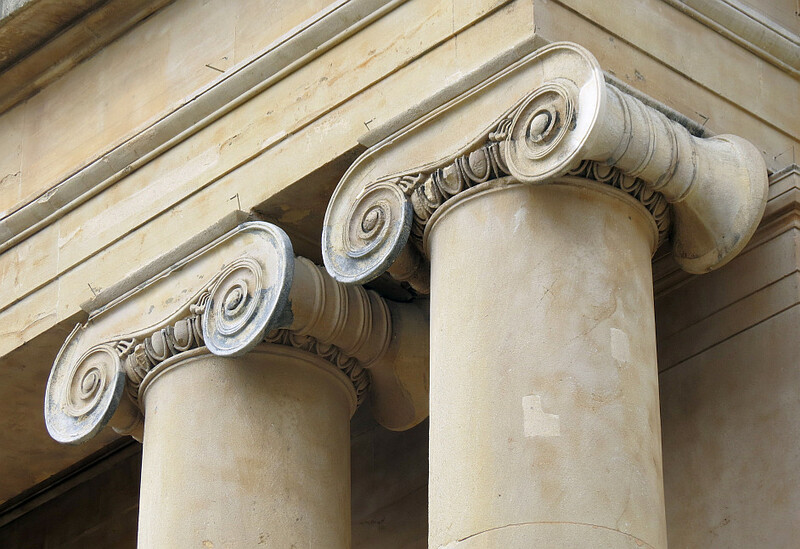 A four-columned Ionic portico is attached on the front, with blank pediment – a missed opportunity for sculpture – and attachments at the sides include further paired pillars. There is a balustrade around the top. A tower, square in cross section, rises solidly rather than loftily above, with clock faces and a pillared storey – Corinthian this time because that gives a slender pillar avoiding a top-heavy look, with on top of this, a third storey consisting of an octagonal cupola with a bell shaped top. Bracket carved with Acanthus leaf . 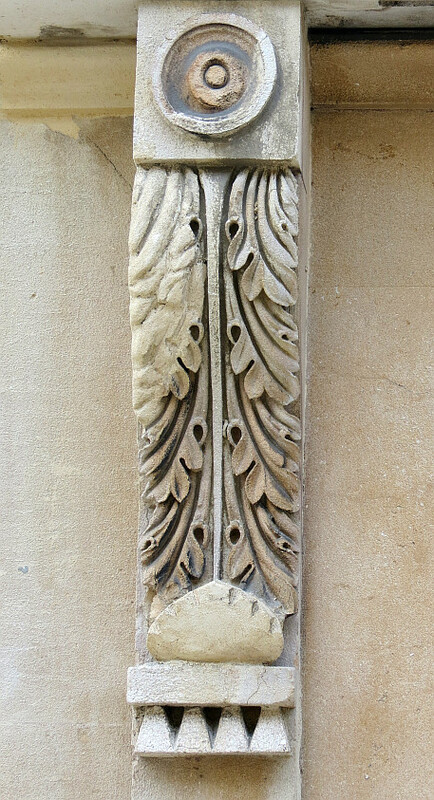 Sculptural detail is confined to the simple Ionic pilasters and brackets with Acanthus leaf carving – overall then, a decent building of some nobility and presence, but done to a budget. It was put up from 1822-24, and made redundant in the 1970s.